The Ora model in SaddleBrooke Ranch Villas is a great choice for those looking for a retirement home or winter retreat. With almost 1,404 sq. ft. of living space the Ora home is an open great room floor plan. Those winter guests will be so comfortable they won’t want to leave. The Ora floor plan provides a great room living style with dining area and kitchen. 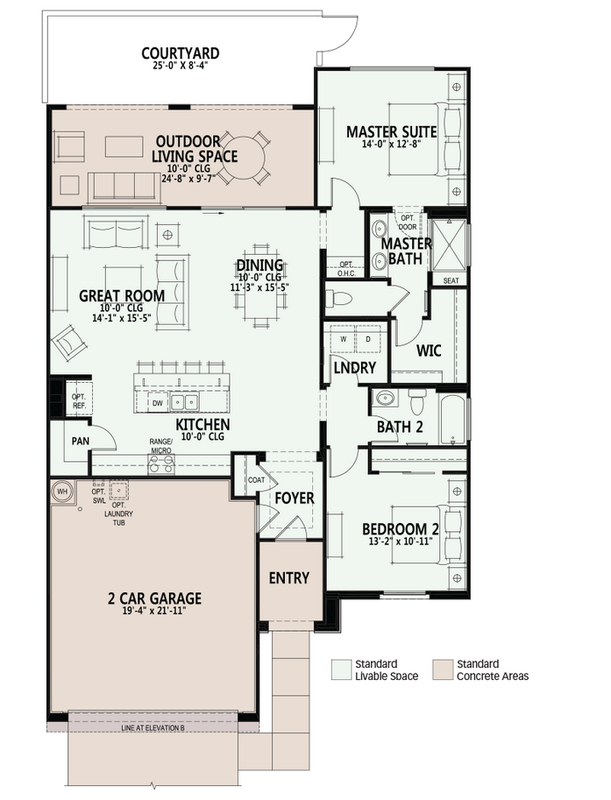 The SaddleBrooke Ranch Villas Ora Floor Plan is the smallest at 1,404 ft. sq. But if you are considering a winter retreat, it may be just right for you. The SaddleBrooke Ranch Villas Ora Floor Plan offers 2 elevations for architectural styling choices. Interested? Give us a call. We would be pleased to arrange a Stay and Play visit to fit your schedule – 520-940-4541. Considering A Home In SaddleBrooke Ranch Or SaddleBrooke Ranch Villas? Are you thinking of buying a home in SaddleBrooke Ranch or another 55+ adult community? If so the SaddleBrooke Ranch Villas Ora model may be perfect for you. If not, there are other options. Build one of the other model homes or look for a resale. We will help you find the best option for your lifestyle and budget.